...the days are so busy. ...we're finally getting into the rhythm of school life. ...it seems we're spending more time than I would like in the car. ... I'm working towards more Steady Days. A good book. ...from our garden, we picked our first apple, a Cox's Golden Pippin. 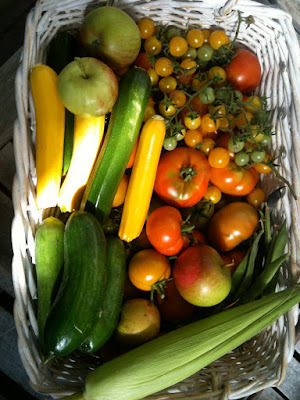 ...we're eating loads of tomatoes, zucchini, corn, cucumber. Here is one day's harvest. ... the garden is full of sunflowers. I planted so many. I took this photo standing at the base looking up. It must over two metres tall. Next year I will plant so many more. A field of sunflowers would be so amazing. And now I have lots of seeds. ... the days are busy and getting shorter. And right now we're enjoying the last days of summer...in the car, with the top down. Beautiful home gown vegies Michelle! Hee Hee. Looks perfect for driving.